We give you our take on the crossing between Atletico Madrid and Juventus, and why the Colchoneros should be very afraid of Cristiano Ronaldo. With the Champions League draw already set up for the Round of 16, it’s time to reflect on all that Cristiano Ronaldo has done in the first semester with the Vecchia Signora and why Atletico Madrid should be very afraid of him. This man has truly overcome the greatest obstacles that any footballer has had to endure in a single season, he has done it very violently in regards to the number of goals he has already scored and the way in which he has transformed Juventus from a great club to an absolute title contender in all competitions. This is where comparisons have to make another appearance, something we really don’t like to do but it becomes inevitable due to how much Cristiano himself has pushed that narrative comparing himself to Lionel Messi. There is still a large contingent (mainly Barcelona fans) who keeps saying that the Argentine is the best player in football history, but Ronaldo has made a ton of people change their minds through his actions in the last five years. Although his public statements can come across as arrogant sometimes, the man always tends to put his money where his mouth is. 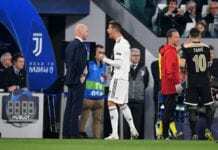 The upcoming Champions League challenge in the round of 16 against Atletico Madrid, will give Cristiano Ronaldo the chance to convert another non-believer to his doctrine. Diego Pablo Simeone was born in Argentina and has always regarded Messi as the best, but this notion could change very drastically after he faces Ronaldo and the Italian giants. The realization of knowing that Lionel Messi will never leave Barcelona, and Ronaldo has succeeded everywhere he played is something that can hit Leo’s fans very hard but will be unavoidable once it starts to sink in. Messi’s football is beautiful to watch but Ronaldo simply outgrows him in almost every aspect at this point in their careers. The Portuguese forward is the perfect football player, one who has everything and is not afraid of carrying his squad regardless of the rival they have. Playing in Serie A for the last few months is the perfect training to prepare Ronaldo and his teammates to face a club like Atletico Madrid, an atypical Spanish squad that more defensive than usual and could give problems to anyone. So far in his career, there is no club that has been able to stop Ronaldo and Atletico should be no different. It’s a bummer for Atletico Madrid’s aspirations this season, because facing a title contender such as Juventus this early in the season could knock them out of the competition in which they aspired to reach the final in their own stadium. If the Colchoneros manage to get past Ronaldo’s Juventus, they will become the instant title contenders. The problem here is that they will have to get past Ronaldo and his squad first, something that only Jose Mourinho’s Manchester United and Young Boys have been able to accomplish this season in any competition. Juventus is still undefeated in Serie A with Cristiano Ronaldo leading the charge, whereas Atletico Madrid is still fighting to win La Liga in one of the most competed tournaments in recent memory for Spanish football. Simeone’s boys are not as dominant as Juventus has been this season in their respective competitions, but that may also be because Italian football isn’t nearly as competitive as many squads in Spain are this season. The Atletico Madrid vs Juventus match-up is arguably the most interesting of the bunch, but there is a lot to choose from. How many goals can Ronaldo score against Atletico Madrid this season? Please share your opinion in the comment section down below.